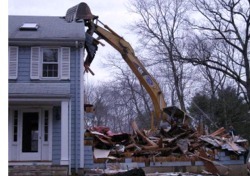 JCM Services, Inc. provides comprehensive demolition services throughout Southern Connecticut and New York. Because we offer a wide variety of demolition services, we can eliminate the need for multiple contracts and inter-trade disputes. We also streamline project timelines, saving our clients time and money. Our talented staff provides engineering, consulting and site services. We pride ourselves in thinking outside the box and finding new ways to improve on old demolition processes. Our demolition experience ranges from selective interior/exterior demolition to the leveling of entire residential & commercial building complexes. From knocking out interior walls to total building and site clearing, JCM Services offers comprehensive demolition services and provides unequalled performance, safety and efficiency. When the project involves the removal of all building structures, we are teamed with the most experienced partners in the industry to remediate the site of hazardous materials. Once complete JCM Services begins its demolition process, including, the recycling of materials, assuring our clients that the work will be completed on or ahead of schedule, in the safest & most cost-effective way.